Get some cultural insight at Rock Church and Sea Fortress Suomenlinna. Get some historical perspective at Helsinki Cathedral and Uspenskin Cathedral (Uspenskin Katedraali). Take a break from Helsinki with a short trip to Nuuksio National Park in Espoo, about 46 minutes away. And it doesn't end there: tour the pleasant surroundings at Aurinkolahti Beach, take a stroll through Ullanlinna, take in the spiritual surroundings of Kamppi Chapel of Silence, and take an in-depth tour of Seurasaari Island and Open-Air Museum. To find where to stay, reviews, ratings, and tourist information, refer to the Helsinki trip website . Cape Town, South Africa to Helsinki is an approximately 18.5-hour flight. Traveling from Cape Town in August, expect somewhat warmer with lows of 13°C in Helsinki. Finish your sightseeing early on the 16th (Fri) so you can drive to Turku. Kick off your visit on the 17th (Sat): browse the collection at Turku City Library, step into the grandiose world of Turku Castle, and then head off the coast to Vepsa Island. On the 18th (Sun), you'll have a packed day of sightseeing: explore the wealth of natural beauty at Kurjenrahka National Park, enjoy the sand and surf at Ispoinen Beach and Sauna, then contemplate the long history of Kuusisto Manor, and finally contemplate in the serene atmosphere at Turku Cathedral. For traveler tips, more things to do, and more tourist information, you can read our Turku travel site . Traveling by car from Helsinki to Turku takes 2 hours. Alternatively, you can take a train; or fly. In August, daily temperatures in Turku can reach 23°C, while at night they dip to 12°C. Wrap up your sightseeing on the 18th (Sun) to allow time to drive to Pori. Pori is a city and municipality on the west coast of Finland. On the 19th (Mon), tour the pleasant surroundings at Kirjurinluoto, then don't miss a visit to Juselius Mausoleum, and then stroll through Yyteri Beach. To find reviews, more things to do, maps, and more tourist information, refer to the Pori trip itinerary tool . Getting from Turku to Pori by car takes about 2 hours. Other options: take a bus. August in Pori sees daily highs of 22°C and lows of 12°C at night. Wrap up your sightseeing on the 19th (Mon) early enough to drive to Vaasa. Kick off your visit on the 20th (Tue): step off the mainland to explore Kvarken Archipelago World Heritage Site. Start your trip to Vaasa by creating a personalized itinerary on Inspirock. You can drive from Pori to Vaasa in 2.5 hours. Alternatively, you can take a bus. 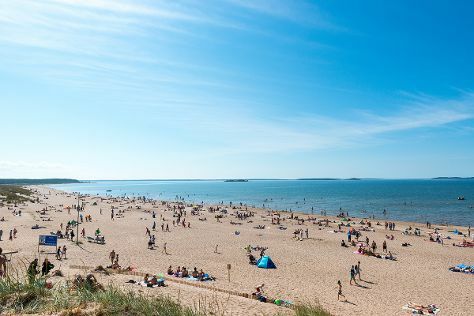 In August in Vaasa, expect temperatures between 22°C during the day and 12°C at night. Cap off your sightseeing on the 20th (Tue) early enough to travel to Rantasalmi. Rantasalmi is a municipality of Finland.It is located in the province of Eastern Finland and is part of the Southern Savonia region. On the 21st (Wed), explore the wealth of natural beauty at Linnansaari National Park. Get ready for a full day of sightseeing on the next day: appreciate the history behind Savonlinna Herostatue - The Hero's Grave, step into the grandiose world of Savonlinna Cathedral, then stop by Taito Shop Savonlinna, then see the interesting displays at Savonlinna Provincial Museum, and finally step into the grandiose world of Olavinlinna Castle. For traveler tips, other places to visit, maps, and more tourist information, read our Rantasalmi online trip planner . You can drive from Vaasa to Rantasalmi in 5.5 hours. Another option is to fly. 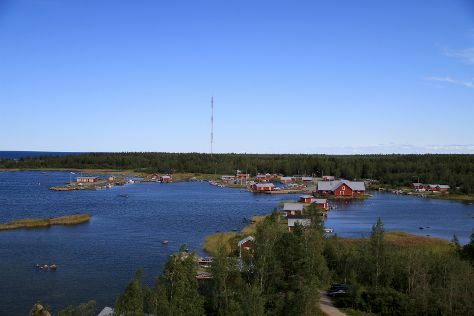 In August in Rantasalmi, expect temperatures between 24°C during the day and 11°C at night. Cap off your sightseeing on the 22nd (Thu) early enough to travel back home.